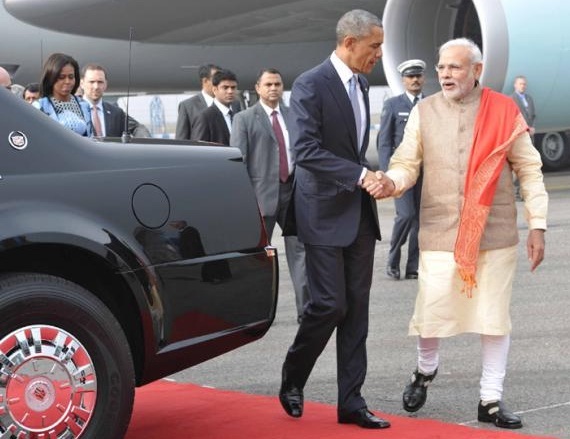 New Delhi, Jan 25: The Civil Nuclear Agreement between the USA and India has been sealed. The N-Deal that remained stalled since 2008 will now be operational as US President Barack Obama has used his executive powers to remove the tracking clause, which was inserted in the agreement late last year. It remains to be seen what stand the US takes on the suppliers liability issue, one of the last hurdles in operationalising the nuclear agreement. The position on this would be clear when the two leaders-Prime Minister Modi and President Obama–make a joint statement on concluding bilateral talks at Hyderabad House in New Delhi this afternoon. Today’s development is being seen as a major achievement for Prime Minister Narendra Modi. President of India Pranab Mukherjee earlier today welcomed Mr. Obama at the forecourt of Rashtrapati Bhavan. The US President received a 21 Gun Salute and inspected a Guard of Honour commanded by Wing Commander Pooja Thakur at the Ceremonial Reception. Among the dignitaries present on the occasion were Union Ministers of Home Affairs, External Affairs, Finance, Urban Development, Defence; MoS of Power, Coal and New and Renewable Energy (the Minister in waiting); Lt. Governor of Delhi; Cabinet Secretary; Chief of Air Staff; Secretary to the President; Foreign Secretary and Ambassador of India to the USA.